Please click on any of the following categories to see a list of frequently asked questions specific to that topic. 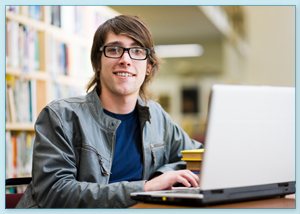 Advanced Academics Online School is a flexible way to earn your high school diploma. Because all of our courses are online, your class schedule is flexible; class begins when you login online and ends when you log out. Our online curriculum is rigorous, engaging, and self-paced. All of our courses are backed by our highly qualified staff of certified teachers who are available via instant message, phone, or email. We also offer 24/7 technical support so that you can get help when you need it. For students enrolled in our Full-Time Learning program, certified counselors will review your transcript/previous school history and work with you to choose the courses you need in order to graduate. How quickly can I move through the course? All of our courses are set up on a 120 calendar day schedule, similar to a typical semester. However, students have the ability to move through the course at their own pace. Since our program is online and completely self-paced, you can enroll at any time of the year. When do I attend class? When you attend class is up to you. Because your courses are online, you can login to your courses any time of day or night. It is important to make time for your courses. It is recommended that students put in the time it takes in order to succeed. It is recommended that students engage in their coursework every day of the regular school week and show weekly progress. Students may log in to their courses any time of the day or evening. Failure to attend courses regularly may result in withdrawal from the program. The online student must take responsibility for his or her own learning. In any online education program, the student must be a self-directed learner, have internal motivation to manage his or her own learning during the course of study, and have a basic grasp of Internet navigation. Advanced Academics Online School requires students to make the appropriate time for their coursework, in order to succeed. Advanced Academics Online School welcomes students, no matter what age, who are interested in taking middle or high school courses in order to earn their high school diplomas. What grade levels does Advanced Academics Online School serve? Advanced Academics Online School has a full, online curriculum for middle and high school levels (grades 6 to 12), should you want to complete your education online or just take a course or two. Can students with IEPs (Individualized Education Plans) or special needs participate in the program? The on-line learning experience will not accommodate all IEP and special needs students. Students with an IEP or special needs will be evaluated on an individual basis by an Administrator to ensure the opportunity for the student’s success. Where do I have to live to participate in this program? We offer middle and high school courses that can be taken in our Full-Time Learning program (6 credits) or individually. What do you need to apply my home school activity to my credits at Advanced Academics Online School? Our admissions advisors will review your previous school history and courses taken to determine the amount of credit we can offer based on our course objectives and academic standards. In some cases, a home school student may be required to take a diagnostic/proficiency exam to determine the right courses. Can I take a course somewhere else and transfer it to Advanced Academics Online School? Students transferring credits from other institutions will work with a representative to complete a transcript evaluation. As a general rule, credits from other middle and high schools that are accredited will be recognized by Advanced Academics Online School and applied toward graduation requirements. For more information, contact a representative toll-free at 1-866-925-1238. What if I can't find my transcript? Contact your previous high school to obtain your official transcript. If you require additional assistance, please contact us toll-free at 1-866-925-1238. It will be necessary to review your prior transcript in order to enroll you in our Full-Time Learning program. When will I be able to start if I register today? If you’re simply purchasing a course or two, once you’ve registered online and payment is verified, you will be allowed to log in to your course immediately. For our Full-Time Learning program, once you apply, you will be contacted by an admissions advisor for a quick interview and then work with a certified counselor to review your transcript and choose your courses. This generally takes about 3-5 business days. Your teacher for each course is a highly-qualified, state-certified teacher who has experience teaching online courses. Your first introduction to your teacher will be in a welcome phone call once your enrollment is approved. Your teacher will give you an overview of the course and answer any questions you have. How can I contact my teacher? You may contact your teacher instantly through our popular instant messaging service. Also you may use e-mail, fax or toll-free telephone to contact your teacher. Certified teachers are available 24/5 (Sunday 10pm – Friday 8pm). We also have a customer support team that monitors the phones 24 hours-a-day, 7 days-a-week, and is available to help you with any technical issues. What do I need to do to succeed in an Advanced Academics Online School course? When you take an online course you need to prepare yourself as you would for any course in a classroom setting. Key differences are that your teacher is online and not face-to-face, and your lessons are on a computer. In an online course, time management is critical to success because most activities can be accomplished asynchronously, which means you don't necessarily have to be online at the same time as your instructor or other students. What materials are needed in order to take Advanced Academics Online School courses? All of the courses offered can be taken 100% online so there is very little need for any additional materials. Some advanced courses may require additional materials. The only things online students truly need to begin their coursework are Internet access and a computer. All of our courses can be accessed through dial-up Internet access, but high-speed access is recommended. How much does Advanced Academics Online School cost? Tuition varies depending upon the type and number of courses you are taking through Advanced Academics Online School. For details, please see our tuition page. Students who enroll in an Advanced Academics Online School are entitled to a full refund within 10 days of their initial enrollment, minus a course-drop fee of $50 per semester course. If a student withdraws or is dropped after the 10 day period, they will be responsible for the full amount of the course(s) purchased. Is Advanced Academics Online School accredited? Advanced Academics Online School is fully accredited by The Commission on International and Trans-Regional Accreditation (CITA), the North Central Association (NCA), and the Northwest Association of Accredited Schools. For more information, visit our accreditation and affiliations page. Will colleges accept my Advanced Academics Online School diploma as a real high school diploma? If you are interested in attending college, it is important to remember that the admissions requirements may vary among colleges and universities. Because you are receiving a diploma from a fully accredited program, there should be no reason why your diploma should not be recognized by the majority of colleges and universities. Graduates from any high school, including Advanced Academics Online School, should contact the college of interest to ensure all entrance requirements are met by a high school diploma from Advanced Academics Online School. What are the graduation requirements for Advanced Academics Online School? For details, please visit our graduation requirements page. Who will issue my diploma? Advanced Academics Online School will issue the diploma once you have completed all of the requirements for graduation. If you are simply taking a course or two and transferring the credit earned to your local school, that school will issue your diploma. Do I have to have a computer and Internet to be a student? Because this is an online program, it is essential that a student have access to a computer and Internet. If you don’t have a computer – you may be able to access the program from the computer of a local library or Internet café. If you have a computer or laptop at home, review our system requirements to ensure you have everything you need. Do I have to have a high-speed Internet connection? You can successfully access our courses with a dial-up Internet connection, but we recommend high-speed access for the best experience.